Throw More Money at Education? Here, Joshua Fulton provides a lot of information about why the President's call to throw more money at education in America isn't a great idea, popular though it will surely be. I guess I must be something of a strange academician, arguing as I do that financing education more and more through tax dollars, while requiring just about nothing from the recipient of the educational services, is a really bad idea. I have been a teacher since 1975. I have taught high school; I have taught at major research universities, and I have taught at small colleges. My experience tells me that what is free is not valued. My own educational experience further confirms what my professional teaching career suggests. Education is important, of course. I also believe that education offers what economists call "positive externalities," which is to say that others benefit from my kids becoming educated. In fact, many people would be willing to pay to help educate my children, because they themselves benefit from my children becoming educated. All that noted, my experience convinces me that "free" education (an impossibility, of course) is a bad idea. Education can be made nearly "free" to the recipient with Pell grants, scholarships, and so on. Others pay for the educational services, of course. That's just ECON 101. Very basic stuff. People who pay for their own education take their own education much more seriously than people who do not pay. Yes, yes, I know there are exceptions; I'm not interested in setting policy by exception. Think about it. If you have to pay for your own education personally --- say like you have to pay for your own car personally --- do you think you will take your own education seriously? I know you will. But not everyone can afford to go to college, you say. True, and fine. Let those who cannot pay with money pay with service. Bera College has long been a model for financing higher education through service. Check it out here. How about providing public funding for higher education and for technical training to those who first serve, either in the military for three years, or in Ameriacorp, or in Peace Corp, or in some other corp we might imagine. Just don't make it free. I also do not particularly favor debt financing for education, but I will leave that topic for another day. 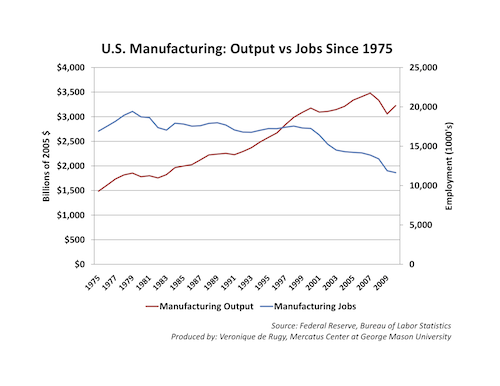 Is U.S. Manufacturing In Decline? No. Read about it here. Next time you hear that our economy is in the doldrums because we just don't make anything anymore, you will know you are listening to someone who hasn't done their homework, and really is just wrong. If that someone happens to be a politician, please don't vote for that person ever again. If that person happens to be a President, that recommendation should be underscored. If that person happens to be a journalist, you will now know who not read. If that person happens to be one of your college professors, you have my complete and utter sympathy. Maybe you should drop the class? U.S. companies still manufacturer far more than everyone else in the world, including China. We just do it with such high productivity that we don't need everyone working in factories anymore. The very same thing happened in agriculture in America during the first half of the 20th Century. Now it's happening in manufacturing. But what about all those lost jobs? If you are someone whose labor services are no longer in demand, you definitely have an immediate problem. But the problem is an old one; it's the same problem the candle makers had when electric lights became all the rage. So what to do? I think we already know the answer. Would You Buy A Used Car From These Guys? Here, one of my favorite economists and essayists, Robert P. Murphy, provides yet another look at the Ben Bernanke Fed's explosion of the monetary base. 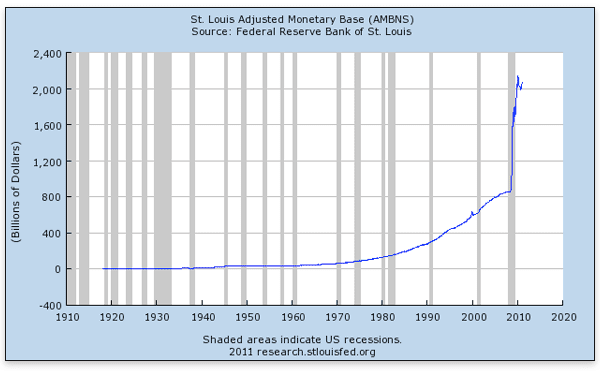 From the St. Louis Fed, we get the nearby chart. But Uncle Ben says not to worry. Yeh, right. That puts my mind at ease. How about you? The Fed has pumped up the monetary base through purchases of U.S. Treasuries and toxic assets formerly owned by banks and other financial institutions. If you think that nothing important is happening when the Fed buys U.S. Treasuries, I would invite you to think harder. If the U.S. Treasury is growing its debt, which it definitely is, and if the Fed buys additional U.S. Treasuries, which it is, the Fed is monetizing part of the Treasury's debt. If I'm wrong about that, I'd really like someone to explain where I'm missing the boat. Monetizing Treasury debt is printing money. Some folks are concerned about inflation. Some folks aren't. If you have what amounts to a fixed pot of dollars to finance your spending in the future, you should be concerned about inflation. Your pot of money will end up buying much less real stuff when you get around to spending it. If your pot of money will expand at approximately the rate of inflation, you don't need to be so worried about inflation, per se. More than I'm worried about inflation, I'm concerned about the Fed financing the U.S. Treasury by creating additional bank reserves. Inflation is a form of taxation. Inflation is created by government, everywhere and always. Only government can create inflation, notwithstanding how many angels actually can stand on the head of a pin (I say it that way because I can hear some economists mumbling in the background about one an another technical detail that I'm leaving out). Hey, if you're just fine with the U.S. Treasury and Congress directing spending of ever larger shares of our national income, then you won't be worried about the Fed's purchases of U.S. Treasury bonds, notes, and bills. But if you do have some pause about how much of our national income is controlled by Washington and the 545, then please understand that the prospects of future inflation are only a potential side effect of the problem with current Fed policy. For me, prospects of inflation are not the main event. You can make your own call, of course, but I would not buy a used car from Congress or the Fed. Still Believe in Keynesian Magic? Here, Brad Schiller does the unemployment math for us. 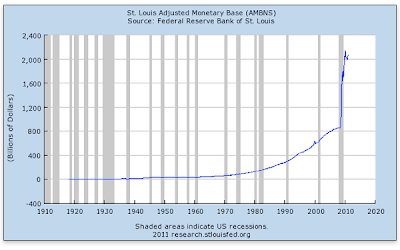 Anyone who still believes in Keynesian debt spending to "stimulate" the economy must be smoking something. Arnold Kling has a much more sensible hypothesis about persistent unemployment. He calls it PSST, for Patterns of Sustainable Specialization and Trade. You can listen to a podcast about it here. You can begin reading about it here. Kling's basic hypothesis is that we get high, continuing unemployment as a result of a mismatch between abilities available in the labor force and potential for using those abilities to produce sustainable production and trade. That makes sense. If all you have to offer an employer is hammering, what do you do if potential employers don't use nails? Time for macroeconomics to admit its deficiencies and move on. Arnold Kling offers a refreshing and promising path to explore.